Links to tools we find useful are provided here. Some of them are free tools from Control Solutions, and you can download those here. Some are free tools from third parties available at the links provided. Some are purchased from third parties, but we are providing links because we use these tools frequently and find them useful. Some additional links to frequently requested information are also provided. This free tool, whan accompanied by the MTX002, can be used to help you locate MS/TP devices when you may have lost track of settings such as baud rate, max master, MAC address, etc. If you know what speed the network is running at, select the baud rate and click Connect. But if you need to “search” for the right baud rate and other settings, click Auto Connect and wait a minute or two. The discovered baud rate, along with discovered max master setting, will be displayed when the auto connect process is done. This tool You may also use this tool as an object browser. Once you have selected a device on the Who-Is tab, go to the Read/Write tab. The object types supported are included in the Object Type list - only the basic types are supported by this tool. The most common properties are listed in the Property drop down list, but you can select “Other” and enter the BACnet property code in the window next to the list. For example, 85 would give you present value. This tool is useful without any additional connection hardware if using it with BACnet IP. Using it with MS/TP requires the Control Solutions MTX002 USB to MS/TP adapter. This tool will not run with a generic RS-485 port adapter. A standard PC serial port with an adapter is not capable of 76800 baud, but the MTX002 does allow your PC to connect to an MS/TP network running at 76800 baud. A free set of BACnet tools useful for testing BACnet IP from your PC is available at sourceforge.net. A subset of these is provided here for quick and easy download. The commands provided in this set include "Who-Is", as well as read and write property. These commands are run from a command prompt on your PC. Wireshark (available at www.wireshark.org) is a well known, widely used packet capture tool for networks. 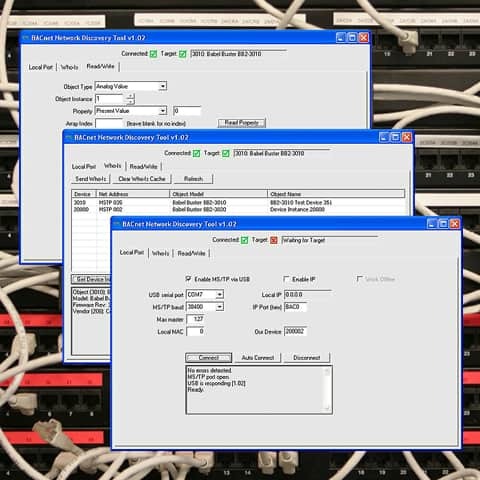 It can be used to capture BACnet IP and all other forms of IP traffic by simply running it on your PC and connecting to your Ethernet interface. Run the program by simply providing a COM port. While running, it will show the captured packet count. Type Ctrl-C to stop capture. The program will then display a summary of packets captured. It will also have created a .cap file which will display the Wireshark file icon if you have already installed Wireshark. 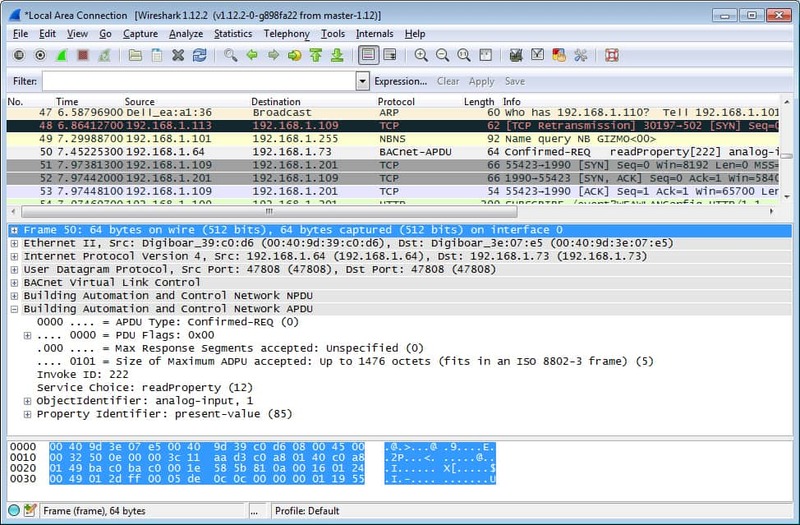 If Wireshark is present, simply double click the file and it will open in Wireshark. You can use a standard PC COM port and generic RS-485 adapter with the capture program. Since the capture is running as listen-only, Windows can keep up. However, if you need to connect to MS/TP at 76800 baud, you will need the Control Solutions MTX002 USB to MS/TP adapter. The compiled, ready to run, version provided here has been modified to not display all token passing, and only display data requests and replies. A second version is included which will include all token passing if desired, but the result is a capture log that often consists of many tokens that you have to search through to find meangful data. 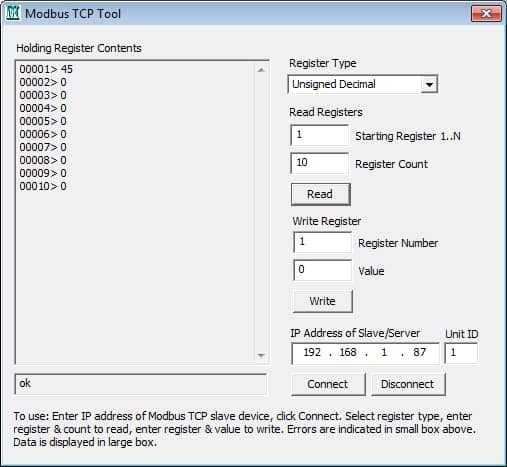 This free Modbus TCP Server Test Tool, created by Control Solutions quite some time ago, allows you to read and write registers from a Modbus TCP slave (server). This may be used to test the Modbus TCP server found in any of the Control Solutions Modbus TCP gateways or I/O devices, or any other Modbus TCP device. Simply Google "Modbus RTU test software" or "Modbus TCP test software" to find an assortment of Modbus test tools. Some are free, some have a free demo, and others are available for purchase. We at Control Solutions have tested some of these, and know that our customers have also tested others. We do not use all of the available tools on a regular basis, and are therefore avoiding any specific endorsements here. 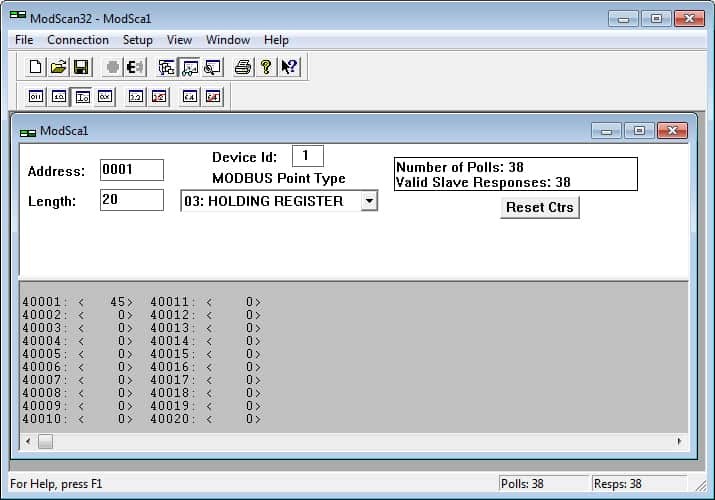 The Modbus diagnostic tools we use most often at Control Solutions are ModScan32 for testing Modbus slaves (either RTU or TCP), and ModSim32 for simulating Modbus slaves when testing Modbus masters. These are available for purchase (from Win-TECH) for a very reasonable price. These are certainly not the only Modbus tools available for purchase (see note about searching for others above). Win-TECH is simply the one that has been around the longest, and we have been using their products for about 20 years. We find that if ModScan can talk to it, there is a 99.99% chance that a Babel Buster can talk to it as well. After further analysis, we found that those rare exceptions were with devices that did not fully comply with Modbus protocol specifications in the first place. ComView is a (free) simple program that posts to the PC's command prompt screen whatever bytes it sees on the serial communication line. It can be useful to see raw Modbus RTU packets for trouble shooting purposes. It does not create a Wireshark capture file, but Modbus RTU is simple enough that one can generally decipher what is going on by inspecting the raw packets (unlike BACnet). When ComView is connected via an RS-485 adapter on the PC's COM port, it will "listen only" to traffic between an RTU master and the RTU slaves. We at Control Solutions most often use ModScan or ModSim for testing. But if there is some question about whether Modbus is sending the right function codes, then ComView lets us see whatever is on the link. While we use this tool most often for looking at Modbus RTU, it can be used to monitor communications from any other serial device as well. When connected to an RS-485 line through a port adapter, it will "listen only" to any communications on the line regardless of protocol. Monitoring communications between two RS-232 devices is a bit trickier - you need to connect only the receive line on the ComView port, and will only see one side of the communication. An SNMP MIB Browser is a very useful tool for testing SNMP agents (you can Get, Set, and Walk the MIB) and is also useful for verifying that your SNMP device is sending SNMP Traps as expected. The iReasoning MIB Browser is reasonably priced and works very well - we have been using this tool at Control Solutions for a long time. There are free SNMP tools available, but we have found them to be either too limited or difficult to use. The only free tool that did work well was "decommissioned" by its vendor. Wireshark is an extremely useful tool for working with Ethernet, whether Modbus, SNMP, or BACnet IP. This packet sniffer captures data on your PC's Ethernet port and displays a tree structured breakdown of each packet. Wireshark understands and decodes Modbus, SNMP, BACnet IP, and virtually every protocol available on Ethernet. Once in a great while, we get an inquiry about running our products on -48VDC for telecom installations. We do not manufacure -48VDC devices, but you can easily adapt them with a DC/DC converter that creates +24VDC from -48VDC. The primary requirement, other than voltage rating, is that the power supply be ISLOATED input to output. Provided the DC/DC converter is isolated, you can run it from -48VDC and get +24VDC out. We do not stock this item, but it is available from vendors such as Newark Electronics and others who are distributors for Phoenix. The Modbus protocol specification is available at no cost in the Technical Resources section of the official Modbus site www.modbus.org. You will find an assortment of Modbus technical reference material at this site. The BACnet protocol specification is only available by purchase at the ASHRAE Bookstore. LonWorks protocol is officially recognized as CTA-709.1-D and is also included in several other industry specific protocol specifications. CTA-709.1-D is available by purchase at www.techstreet.com. There is no one document that defines SNMP protocol. It exists as a set of numerous "RFCs" available at many sites including this site: www.ietf.org/rfc.html. You can learn more extensively about SNMP here: www.net-snmp.org. The Net-SNMP site is probably the most thorough resource you are going to find without spending money. There are a number of books published on the subject of SNMP that may also be helpful.